On May 13, 2014, South Florida resident Robert Baumann went to pick up his daughter, Lilly, from the home of her mother, Megan Everett. When he got there, Everett and Lilly were nowhere to be found. Everett and Baumann had been together only a few months when their daughter, Lilly, was conceived. Everett ended the relationship before Lilly was born and reportedly wanted to cut Baumann out of her and her daughter’s lives. Through the intervention of Everett’s mother, Pam, Baumann was able to be present for Lilly’s birth and to spend time with his daughter, once or twice a week, for the first couple of years of her life. When Everett moved in with Lesters, her new boyfriend, Baumann grew concerned about losing access to Lilly for good. He was also troubled by photos showing Lilly playing near live ammunition and surrounded with Confederate flags. “I don’t see her playing with toys in any picture. I see ammunition,” Baumann said. “I spoke to Megan about it, and it was, ‘Oh well,’ you know, ‘Take me to court’.” So he did. Baumann petitioned the court for full custody, with two surprising allies in the fight: Everett’s mother, Pam, and her older sister, Stephanie. Even with Everett’s family on his side, the court did not grant Baumann full custody. Instead, he and Everett were granted joint 50/50 custody, alternating weeks. But only six weeks into this new arrangement, Everett and Lilly were gone. Detective Louis Fernandez of the Sunrise Police Department in Florida believes that someone must have helped Everett kidnap Lilly. “I want my daughter to be found. I want my daughter to be safe,” he said. Megan Everett has distinctive chicken pox scars on her chest, arms and face. She’s known to change her hairstyle and hair color frequently. 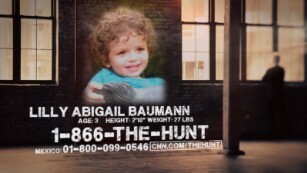 She’s also believed to be with her 3-year-old daughter, Lilly Baumann, who has curly, brown hair. 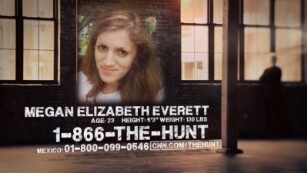 If you’ve seen Megan or Lilly, or have any information about their whereabouts, please call 1-866-THE-HUNT or go to our website at CNN.com/TheHunt. You can remain anonymous. We’ll pass your tip on to the proper authorities, and if requested, will not reveal your name. 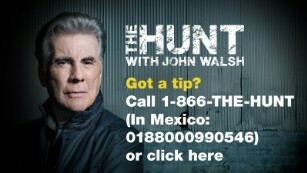 This entry was posted in Uncategorized and tagged Anti-vaccine, Carlos Lesters, Detective Louis Fernandez, John Walsh, Lilly Baumann, Megan Elizabeth Everett, Megan Everett, Parantal Abduction USA, Robert Baumann, THE HUNT, The Hunt With John Walsh. Bookmark the permalink.